When running Google Analytics you might want to exclude yourself from the statistics reports. When you use Google Analytics to track visitor statistics on your website, you can setup so it exclude it from yourself, this can be your computer or network. This will improve the accuracy of your statistical data, since this will otherwise be influence by yourself or staff if you’re running a company. To exclude yourself login to your account on Google Analytics. Go into Admin page select Profiles, then the Filters tab. Type in a filter name e.g. “Exclude me”. 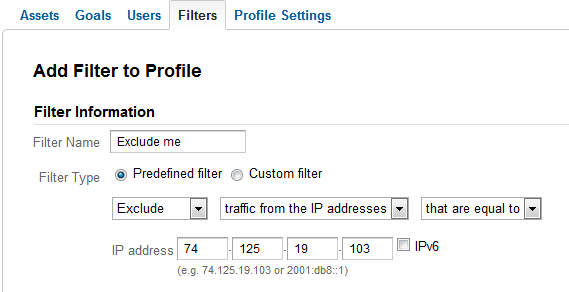 Then select “Exclude” + “traffice from the IP addresses” + “that are equal to”. Now type in your IP address. If you don’t know you IP Address look it up tool. Finished by clicking save. This will exclude you from your google analytics statistics reposts.